Knowing very little about this film going in, I was purely intrigued by the idea of it. The legitimacy with which it placed finding a mermaid was no doubt intriguing and the recent films with which Colin Farrell has chosen seem to venture into different territory for him. In 'Ondine' he plays an Irish fisherman who in the opening scene of the film discovers a woman in his fishing net. This is obviously bizarre and as a viewer we are befuddled as to how this fairy tale-esque element will balance with the gritty realness of a fishing boat captains life. Throw into the mix an ill child and an alcoholic ex-wife we are in for some rather interesting consequences. Not to mention the slow unveiling of Ondine's true story. The entire time we want to believe she is a Silkie (basically a mermaid without the fin). Syracuse (Farrell) stumbles upon good luck when Ondine sings to the ocean and so they form a bond that will of course escalate and his daughter Annie, played by the wonderful Alison Barry does her fair share of research and develops a crucial relationship with the mysterious water lady that has been missing from her life. And while the film gets points for an original idea and a darn good attempt at putting it on film we never get the sense of what is really going on here. Yes, we understand the basic plot and the idea that a child imagination is sometimes a much better world than the ugly truth we would like to ignore. That it would be truly splendid if what Annie believed the reality to be was actually reality. It is not and in the end we are a little let down by this. The film is beautiful to look at and the two leads make a beautiful couple, but overall the film is rather slow and only intriguing up to a point. Neil Jordan, director of such films as 'Interview With The Vampire' and 'Michale Collins' serves as both writer and director here, so we feel the closeness of the images and the story. We see the instinct of what this movie is trying to say and it has its moments, but they are a little to sparse for the two hour running time. 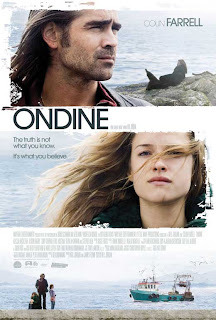 'Ondine' should have made us step out of our own reality for a bit, but instead it tricks us in the beginning into believing we are going to experience a fantastical world, but instead drops us off at the end-right where we didn't want to be. Right where we expected.